It struck me that Shalom was defining her painting practice as a form of active meditation, a way of searching for forms seen by the mind, an amalgamation of memory and imagination. at the same time, I was reminded of the mystery writer Janwillem van de Wetering’s memoir, The Empty Mirror: Experiences in a Japanese Zen Monastery (1973). one of the strongest impressions that book made on me came from the author’s recounting of the monks’ wise humor and gentle jokes, which seemed to be their manner of suggesting another way of seeing and understanding. it is a search for clarity and humor, as is evidenced by the shapes and colors in my paintings: cartoony, bright, blobby. Many of Shalom’s shapes have rounded edges, like the backsides of cartoon creatures. Despite our inability to place a name on these forms, they are not meant to be threatening or frightening. in fact, something close to the opposite happens. they invite close looking and become – in my experience of them – something to meditate on. Shalom further complicates our experience of her paintings by giving them associative titles. by pairing a title like Nice Nelly or Demeanor (both 2015) with an abstract painting, she invites us to nd a relationship between the two. While such a pairing can become a disaster, especially if we are looking for a one-to-one relationship or a literal connection, Shalom recognizes that the paintings, to cite the poet Wallace Stevens, “must resist the intelligence/almost successfully.” Why “almost,” you ask? it is because Stevens wasn’t interested in obscurity, nor did he tolerate clichés to depict the intangible. Shalom is too earthly a painter to focus on signs to suggest transcendence. her paintings begin in things, the palpable world, even as they journey into a domain where they resist the associations she has accorded them, and defy being reduced to a metaphor. Can we see things for what they are, even if we cannot name them, cannot in that regard have dominion over them? the question seems both aesthetic and ethical, which is the strength of these paintings. They don’t become a surrogate for something, a symbol. take the painting On the Verge (2016) and the fact that the artist has titled the exhibition Ambiguous Characters. 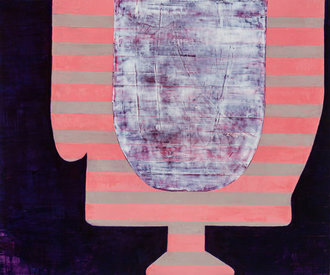 there is a red form in the shape of an l; it has been inverted so that it rises, like an abstract animal’s head, from a blue band spanning the bottom of the painting. another shape in the form of an l, which is made of orange rectangles outlined in blue, runs down most of the red shape’s right side and along its bottom edge until it extends into what we might read as the red l’s neck. i see On the Verge as a delicious visual paradox. on one hand, you can read the shape as a cartoon beast with large teeth, but that ignores too much of what does not t into that humanizing response. it is a head without a face, for one thing. on the other hand, it is the joining of two l’s; one is rounded and bulky in form, while the other is geometric and divided into rectangles. this form, made of two abstract shapes, is set against a black ground so that its colors – red, orange and blue – become holders of light, sources of illumination. instead of trying to answer the question, “What am i looking at?” the painting challenges us with questions of its own. Can you luxuriate in the state of not knowing what you are looking at? if you can’t, doesn’t that say more about you than about the painting? if you feel uneasy, what might that mean? the title, On the Verge, can be understood as on the brink of becoming namable. in this sense, the title points to your anxiety, but with a gentle sense of humor. the possibility that we are looking at a nameless creature is also suggested by paintings such as Agent Provocateur (2016) and Fortissimo (2015). however, rather than forcing a name upon these entities, isn’t it more satisfying simply to appreciate the awkwardness of their rounded forms, the unlikely joining of their divergent parts? We might further consider the ways the paint has been applied, the different textures they convey. We should then go on to think about Shalom’s use of color, which always comes across as specific to the particular painting under scrutiny. in these works, as opposed to the ones in Just This, her 2014 show at the Painting Center, the palette seems brighter, more saturated, sharing something with a child’s playroom, that is, if the Mad hatter and Jeremy Bentham had painted it. Bentham (1748-1832) came up with the concept of the Panopticon, a round building whose inhabitants (prisoners) could be viewed by a single observer (watchman). I am thinking of the painting Maverick (2015), which seems, on the face of it, to be an aerial view. The greens, grays and umbers Shalom uses in her work can be reminiscent of institutional interiors. remarkably, they stop just short of being drab. and it is in the stopping short, and in her use of dusky pinks, deep blues, and dark violets, that we get a sense of Shalom’s masterful sense of color. She can use dowdy and electric colors in the same painting. this is not impressionist color – there is something grating, gritty and urban about her palette. by refusing to use seductive color and eye-pleasing combinations, Shalom folds another possibility into our reading of her work. instead of looking at the paintings, we must engage with them. to my mind, that offers the deepest pleasure of all. John Yau is an art critic and poet. *Shunyro Sukuki Roshi, from Zen Mind, Beginner’s Mind.